In the increasingly commoditized wireless security camera world, Guardzilla’s sales pitch is tough to beat. A sub-$100 sales price. No monthly fees. One minute setup. What’s not to like? Right out of the box, the plastic Guardzilla pyramid starts off with a roar. A spare, index-card-sized quick guide takes you through just four steps to get things going: place the camera where you want and plug it in, download the app for iOS or Android, join Guardzilla’s temporary Wi-Fi network, then follow along through the configuration wizard to join your permanent LAN. This process, while a bit more time consuming than 60 seconds, is intuitive and simple enough for novices. The only hiccup is that you’ll need to manually enter your standard Wi-Fi network name, password, and the security protocol it uses; so it’s best to find out if you’re running WPA or WPA2 before you start setting things up. Push Guardzilla's Panic button and it will emit a loud siren. Guardzilla is managed primarily from a very basic admin screen on your phone, with just five options arranged in a Skittles-colored spray of buttons. Most are self-explanatory, letting you arm or disarm the system, check a live feed, and review the history of activity in the room you’re monitoring. 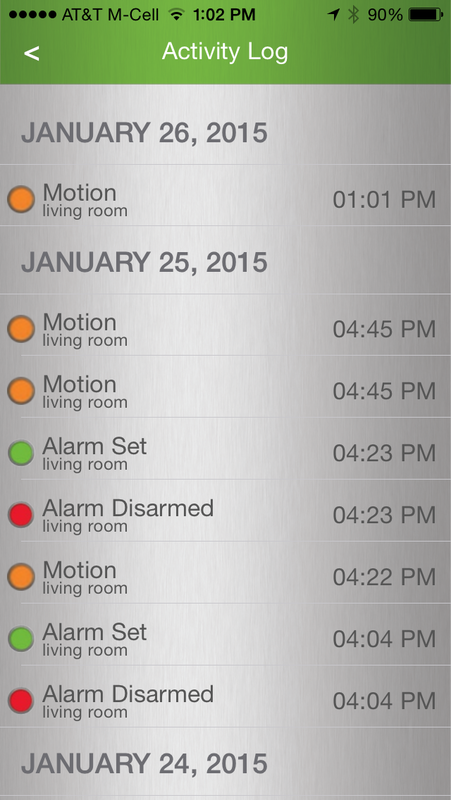 A unique option—Panic—lets you quickly trip Guarzilla’s built-in audible alarm. The (purported) 100-decibel klaxon is shrill, though not much more menacing than a smoke detector siren. By digging into the Settings menu, Guardzilla can be configured to work in a variety of ways. Like most security cameras, it can keep an eye out for motion, and then capture snapshots when movement is detected. 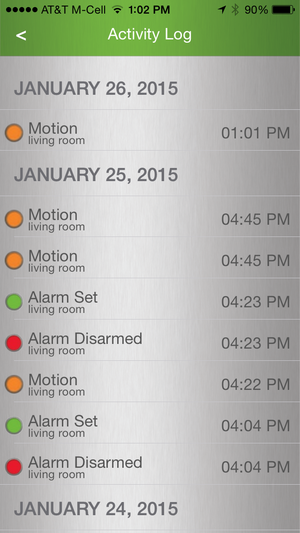 You can also set it to sound that built-in alarm, if scaring off intruders is your goal. Guardzilla includes a night-vision mode, too, but this can be disabled at the user’s discretion. If Guardzilla detects movement in its frame, it snaps a series of three photos, and then saves them in the Guardzilla app. Plug a MicroSD card (not included) into the device itself, and you can record video (either continuously or only when the alarm is tripped), but there’s no way to access that video aside from ejecting the card and plugging it into another device. All of this would be swell if it wasn’t for some serious bugs that impact Guardzilla’s utility. First, motion sensitivity was erratic in my testing. Five sensitivity levels are available, but even on the maximum sensitivity I would typically find that Guardzilla would not detect a person’s presence in the frame unless I was just a few feet from the device. Walking in and out of the frame when I was more than about 20 feet away made me functionally invisible to Guardzilla, a condition that considerably limits its utility. Guardzilla delivers resolution of only 640x480 pixels, but its images are clear enough to capture faces (see the image on the right). 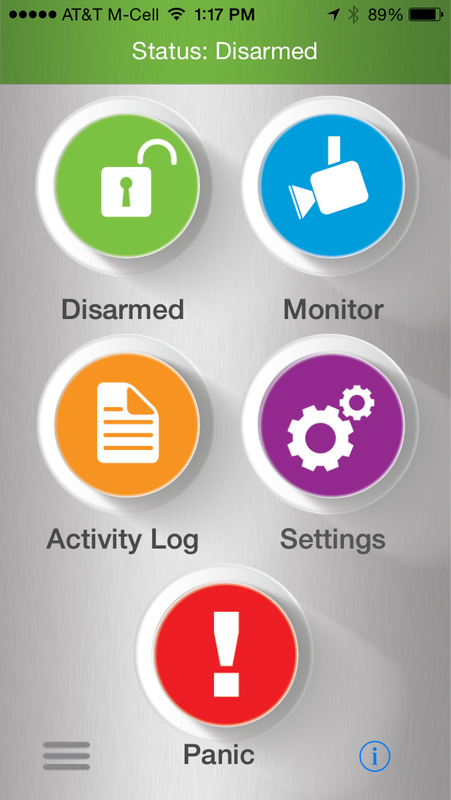 Guardzilla’s app is easy to use, but my early encounters with it were frustrating experiences with frequent hang-ups. Early on, even simple actions like arming the system or saving a snapshot from the live video feed resulted in the app hanging and having to be restarted. Fortunately, after a few days of regular use, these problems disappeared and the Guardzilla app began behaving normally. An activity log keeps you informed. One of the more progressive features of Guardzilla is its ability to auto-arm the device based on when you leave the house. Turn on “Auto Arm” and Guardzilla will arm itself, in theory, if you move about 300 feet away from the location you specify. Unfortunately, this feature simply didn’t work for me. Guardzilla wouldn’t arm itself no matter how often I went out or how far I traveled. This feature (presuming it works at some point) could also spell trouble if two people run the Guardzilla app and only one leaves home. Guardzilla offers three ways to get notifications that motion is detected and the alarm has been tripped: push notifications within the app, email, or text message. Push and email both worked fine for me—though email delivery is just a bit slower than push—but I was never able to get the system to deliver a text message. There’s also no mechanism to change your email address or phone number within the app except for deleting and reinstalling it. 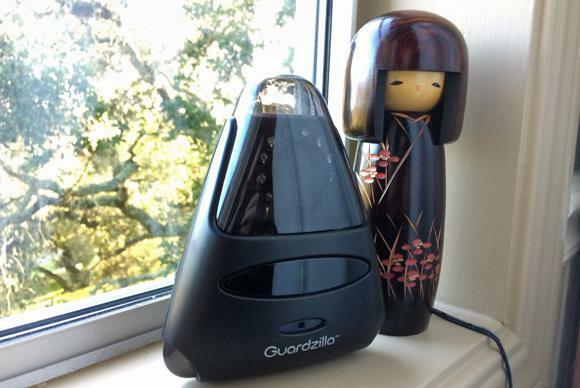 While the Guardzilla hardware is not entirely unobtrusive, it doesn’t immediately dominate the room it’s in, either. Using the tinted lens cover (which is included along with a transparent one) makes the function of the device a little less obvious. Unenlightened thieves may be forgiven if they assume Guardzilla is actually a postmodern Dalek. Unfortunately there is no wall-mounting option for the device. Another plus: Guardzilla’s photo quality is quite good. Both daytime and nighttime stills are crisp and easy to make out (resolution can be configured by the user) with accurate colors in daytime shots, a far cry from the grainy security video of the past. You might also be interested in reading about the Netgear Arlo. For a small environment like the apartment or dorm room for which Guardzilla is intended, its limitations aren’t deal-breakers. While there’s no technical limit to the number of Guardzillas that can be installed on the same Wi-Fi network, the company recommends four at most to make the system manageable. That should be plenty to lock down your one-bedroom. Guardzilla is a very new product, and the company says it is continuing to revamp its app as sales get underway. At press time, a new release was being finalized which would, among other fixes, add a two-way audio feature (promised on the packaging) to the device so you can talk to the guy who’s robbing you, your cat, or both. Even without that feature, and even with its many bugs, the Guardzilla still earns its keep given its sub-$100 price tag. Those needing a very simple security setup and who have appropriate expectations should find it acceptable. Guardzilla is a simplified all-in-one security camera system that detects motion, snaps photos of intruders, and emits a high-pitched alarm, all configurable through an Android or iOS app.